Want more of your emails to reach the inbox? Whitelisting can help! Whitelisting is a term used in the industry and means asking subscribers to add your email address to their address books. Having your messages reach your subscribers inbox is very important to your campaign. By having your subscribers whitelist you in their own email accounts, you can ensure that your messages will be more likely to reach their inbox. Below are examples of some of the more popular clients that your subscribers might be using to receive emails from. 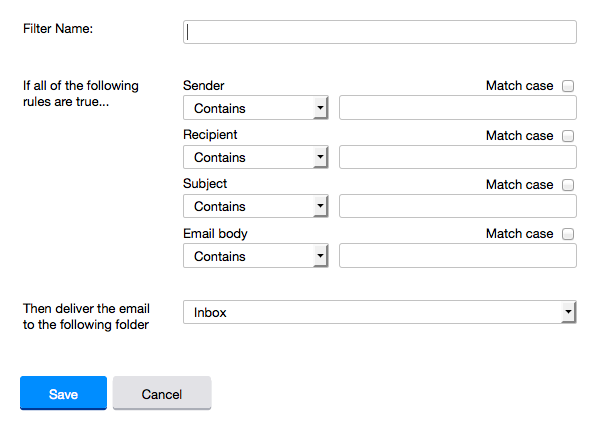 Under each section will display the steps on how to whitelist a sender's email address. Feel free to direct them to this article for the specifics on how they could process this in their own email client. Log into your account and open up the email in your inbox. Hover over the sender's name and a window will pop up. Select "Add to Contacts" to save the sender to your Contacts list. You can also whitelist in GMail before opening the email. To do so, hover over the sender's name next to the subject line in the inbox. Click "More" in the pop-up box. Select "Add to senders" to save to your Contacts list. Log into your account, hover over the "Settings" icon and click "Settings". In the "Settings" tab, select "Filters" from the left menu and click the button to "Add" a filter. Type a name for your filter in the "Filter name" field. Select "contains" in the "sender" drop-down menu. Type the sender's email address in the "sender" text field. 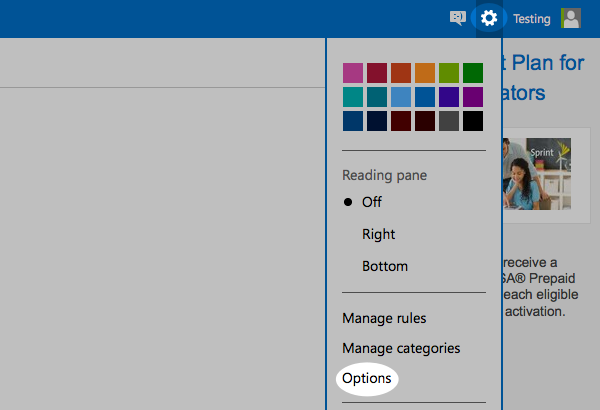 In the "Move to Folder" drop-down menu, select "Inbox". Click the "Save" button in the top bar to save the filter. In the upper right hand corner of your account, click on the "Settings" icon. From here, click on the option for "Options". 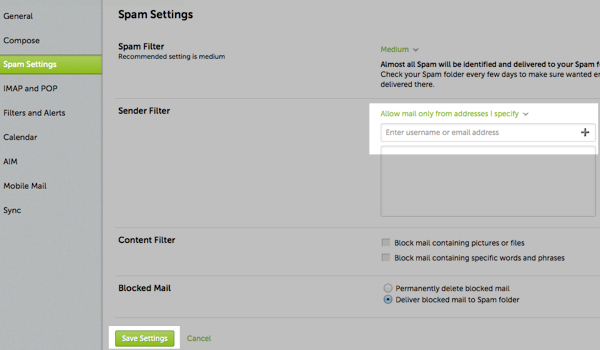 While in this section, click on the option for "Safe and blocked senders". Enter in the sender's email address and click the button to "Add to list". In the upper right hand corner of your account, click on "Options". From there, click "Mail Settings". On the "Settings" page, click "Spam Settings". 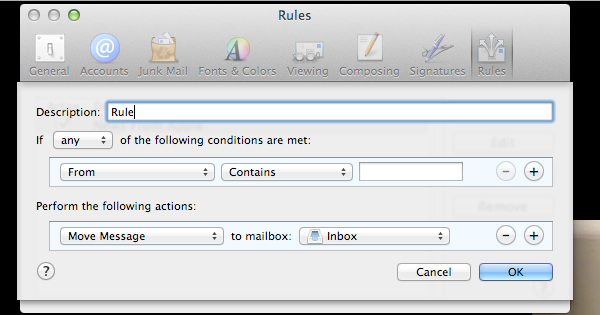 From there, choose "Allow mail only from addresses I specify" on the drop-down menu. Enter in the sender's email address, click the plus button, and click save to save your changes. Right-click on the message in your inbox. Select "Junk E-mail" from the menu. Then, click "Add Sender to Safe Senders List". Select "Mail" and "Preferences" from the top menu. 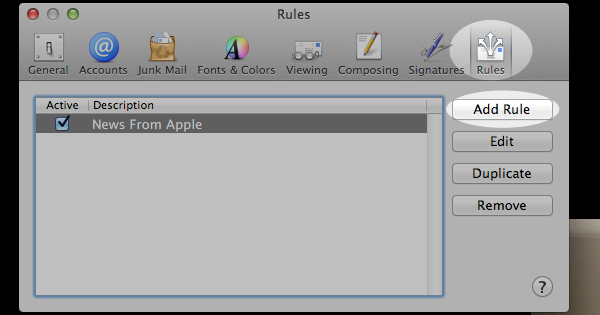 In the "Preferences" window, click the "Rules" icon. Then, click the "Add Rule" button. In the "Rules" window, type a name for your rule in the "Description" field. Use the following settings: “If any of the following conditions are met: From Contains.” Type the sender’s email address in the text field beside “Contains.” Select “Move Message” and “Inbox” from the drop-down menus. Click “Ok” to save the rule. Click "New" and click "New Contact". Add the sender's email address. Under "General Email Preferences", click "Blocked Senders". Type in the sender's email address in the "Exceptions List". Click your "Junk Mail" folder. Select the email that includes the email address you would like to add as a safe sender. In the top row labeled From Header, select "contains" from the drop down menu. Enter the sender's email address. Move down to the bottom where there is the option "Move the message to". Select "Inbox" from the drop down menu. Select the "Add Filter" button again. Enter your sender's domain i.e. example.com. Check if your sender's email is in your "Junk" folder. Then, right click on the email and select "Mark As Not Junk". Make sure that the "Personal Address Book" is highlighted. Click "New Card", the "New Card" window will display. Under the "Contact" tab, copy your sender's "From" address and paste it into the email dialog box. Click "Allow and Block Messages". In the "Allowed Senders and Domains" area, type the sender's email address you want to allow. 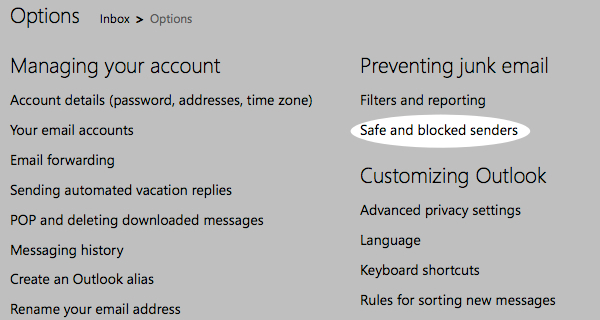 From the email settings screen, select "Junk E-mail Guard". Select "Status & Settings" tab. Click the "Allow/Deny" menu option in the Control Console. Enter the sender's email address in the "Add Entrys" field in the "Allow List". Right click the sender's email address. Select "Add to Address Book". Click the "Plus" symbol on the sender's email address. Add the first/last name of the sender.